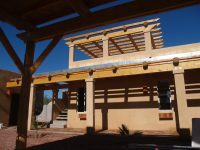 The Guadalupe House, a 2006 affordable and sustainable residence designed and built by the ASU Stardust Center for Affordable Housing, has been nominated for the Arizona Republic Seven Wonders of Notable Structures contest. The home features a design based on the unique characteristics of the town’s Yaqui and Mexican-American community. It is made with “green” materials and techniques that dramatically reduce energy costs.